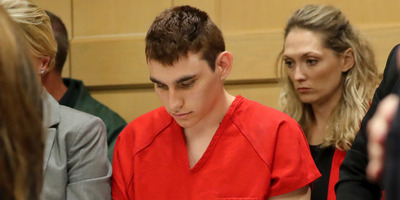 South Florida Sun-Sentinel/Mike Stocker via Associated PressNikolas Cruz appearing in court for a status hearing before Broward County Circuit Judge Elizabeth Scherer in Fort Lauderdale, Florida, on February 19. Nikolas Cruz was indicted on 17 counts of first-degree murder by a grand jury on Wednesday in connection to the Parkland, Florida, school shooting. Cruz has confessed to authorities and offered to plead guilty if prosecutors agree not to seek the death penalty. A grand jury in Florida on Wednesday formally indicted Nikolas Cruz on 17 counts of premeditated first-degree murder and 17 counts of attempted first-degree murder in connection to the Parkland, Florida, shooting. Cruz has been accused of fatally shooting 14 students and three adults at Marjory Stoneman Douglas High School in Parkland on February 14. Cruz could face the death penalty if convicted of the 17 first-degree murder counts, though his public defenders have offered prosecutors a deal for Cruz to plead guilty in exchange for a life sentence. Prosecutors haven’t yet decided whether to seek the death penalty. Grand jurors heard secret evidence and testimony against Cruz on Monday and Tuesday, including from the couple with whom Cruz lived before the shooting. Cruz moved in with Kimberly and James Snead shortly after his mother died in November. The grand jury most likely asked them about access he had to weapons that were stored at their home, the Sneads’ attorney Jim Lewis told the local ABC affiliate, WPLG. Cruz is accused of gunning down the high school’s students and faculty members using an AR-15 assault-style rifle he purchased legally. The Sneads have told media previously that they allowed him to keep his guns at their home, so long as they were stored in a safe. The Sneads said they believed they had the only key. Cruz has been held in a local jail without bond since the massacre.